Until recently, California was one of many states that issued driver licenses or identification cards (ID) that were not compliant with the REAL ID Act. But recent developments indicate that the California Department of Motor Vehicle (DMV) will begin accepting applications for IDs and driver licenses that are compliant after January 22, 2018. Who are eligible to apply for these new IDs and licenses? Will undocumented immigrants be prohibited from traveling domestically if they are not in possession of the new IDs and licenses? In 2005, U.S. Congress enacted the REAL ID Act upon recommendation of the 9/11 Commission to set standards for the issuance of sources of identification, such as driver licenses. This law provided minimum security standards for state-issued driver licenses and identification cards. Federal agencies are prohibited from accepting the non-compliant licenses and identification cards for official purposes including in air travel, access to military bases, most federal facilities and nuclear power plants. The purpose of the REAL ID Act is to prevent the fraudulent issuance and use of driver licenses and identification cards. Although it was enacted in 2005, its full implementation will not take effect until October 2020. In the meantime, many states are taking steps to establish rules that will make their licenses and identification cards compliant with the REAL ID Act. States that are working to comply with the federal law have been able to get extensions until October 2018. For this reason, states like California, are ready to release new licenses and identification cards this year that contain security features. To be REAL ID-compliant, the state must incorporate anti-counterfeit technology into the card, verify the applicant’s identity and conduct background checks for employees involved in issuing driver licenses. In verifying for a REAL ID-compliant ID or license, the applicant must fall under the following 9 categories: (1) U.S. citizen or national; (2) U.S. lawful permanent resident or lawful temporary resident; (3) conditional permanent resident status in the U.S.; (4) has an approved asylum application or entered in refugee status; (5) has a valid, unexpired nonimmigrant visa; (6)has a pending application for asylum; (7) has pending or approved temporary protected status; (8) has approved deferred action status or (9) has a pending application for adjustment of status to that of lawful permanent or conditional resident. It is apparent from the list that only applicants who have valid and lawful presence in the United States or who are not in violation of immigration laws are permitted to apply for state licenses that are REAL ID Act compliant. Those who are unauthorized immigrants or who have fallen out status may not be eligible to apply for the REAL ID compliant licenses. Passing through security at the airport during domestic travel requires acceptable identification documents. The Department of Homeland Security (DHS) has designated several acceptable forms of identification including passports, a border ID card, or, a trusted traveler card such as Global Entry. 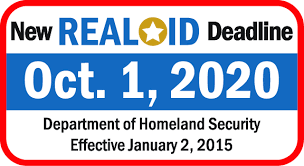 In 2020, only REAL ID-compliant cards will be accepted for air travel and if a traveler is out of status or is in unlawful presence, the traveler should obtain alternative acceptable identification documents, which includes a valid passport issued by the government of which he/she is a citizen. Generally, traveling with a passport with no valid U.S. visa stamp on it does not imply unlawful status. The DHS explicitly cautioned federal agents from assuming that non-possession of REAL ID-compliant identification cards indicate that the traveler is an undocumented immigrant. However, given the current political climate, the restrictive immigration policies and the heightened immigration enforcement rules, it may be a trigger for further inquiry if the TSA or any federal agent exercises discretion of the need to determine lawful presence. In the meantime, considering the implementation of the law is not until 2020, there is no need to change travel domestically. Instead, it is advisable to use this time to determine whether there are legal options that one may now undertake to obtain lawful status before the full implementation of the REAL ID Act.